The following is a guideline to help you understand the procedures for scheduling shopping and volunteer hours, making your monthly payments, and receiving or discontinuing services. Also included is the location of the warehouse and directions to it. If you have any questions or concerns, please do not hesitate to contact the office staff at 503-339-7710 or by email at information.hopestation@gmail.com. Occasionally participants will be contacted for additional shopping opportunities, typically to allow for perishable items to be dispersed to participants prior to spoilage, such as fresh produce. When this occasion occurs, participants will be notified by email or telephone, so please make sure your contact information is current and correct. When shopping, participants need to be mindful of the quantity limits that are noted on the various shelves and/or walls. If you notice that an item does not have a limit ask the Lead Volunteer if there is a limit. Remember there are many families receiving food from Hope Station and our mission is to distribute some to as many families as possible. Note: If you have a friend or relative who is in need of help, refer them to Hope Station. Items received from Hope Station are for your household only. Be mindful of your time spent shopping. You should try to limit yourself to no more than 40 minutes in the grocery warehouse. Participants can get up to ONE cart full of groceries. PLEASE NOTE: Participants are not to unload the cart and go back for another shopping time. We want to have enough for our other families as well. Young children must never be left alone in shopping cart and must be supervised by you at all times. The participation fee is due every month as long as you are enrolled with Hope Station, whether you choose to shop in any given month or not. PLEASE NOTE: Payment must be made on or preferably before your first shopping day. 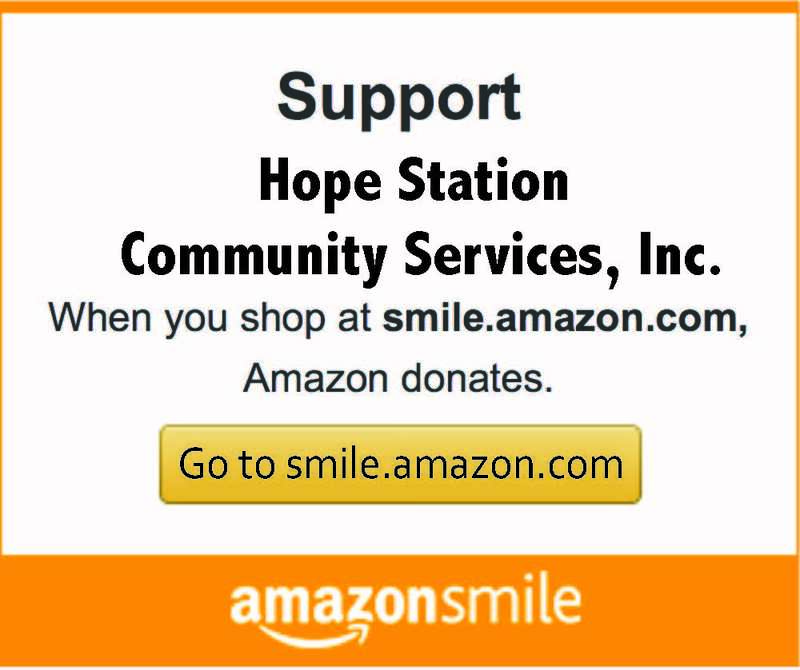 Your monthly payments are important to help Hope Station maintain operations. If you cannot make the payment prior to your shopping day, bring your payment to the office on the day you are shopping. Please make sure you ask for a receipt when paying in person. If you pay by mail, keep a copy of your check or money order for your records. NOTE: Post-dated checks are not accepted. Non Sufficient Fees (NSF): A returned check will result in a fee of $12 plus the amount of the check. It must be paid in cash or via money order prior to shopping. Personal check are no longer accepted. PayPal is for donations only; at this time, we do not accept online payment for monthly client fees. All scheduling is done at the Hope Station office. Please schedule your shopping trips no less than two weeks prior to shopping. The available shopping spaces fill up quickly. Please keep in mind that there is a limit of 6 participants working per two-hour blocks of time and a limit of 6 participants shopping per hour. Your failure to schedule in advance may cause you to lose your shopping day. Lost shopping days may not be made up the following month. If you need to reschedule due to illness or a family emergency, please contact the office at 503-339-7710 or information.hopestation@gmail.com as soon as possible. Participants are required to volunteer two hours per month at Hope Station. This part of your participation is a valuable aspect to the program as well as to yourself. It is through the work of the participants that Hope Station is able to maintain its facility and operations. Hope Station is a service to its members and its members make Hope Station a successful service. Work hours must be completed in one day and for the entire two hours. There is no splitting of hours between family members. Two hours need to be completed regardless of how many family members are working. If you wish to volunteer more than two hours in one month that is very much appreciated. However, the extra hours will not count for the following month. In other words, you cannot “bank” hours for future months. Missed hours must be made up during the following month. Children under the age of 12 cannot accompany you while fulfilling your volunteer hours. Children 12 and older cannot be left unsupervised if they must accompany you. When discontinuing participation, please be considerate of your agreement as a participant and make sure that all of your participation fees have been paid in full through the month of your discontinuance. As stated before, monthly participation fees help Hope Station maintain services to all the families of Hope Station. If you have a financial situation that is preventing you from being able to bring your account current, please contact our office immediately so we can discuss your circumstances with you. The warehouse is located at 1337 Madison St NE, Ste. 115, Salem OR 97301. In addition to regular hours, Hope Station is open on the 2nd and 4th Saturdays of each month. We also have extended hours on the 2nd and 4th Tuesdays of each month. Monday thru Thursday: 10:00 a.m. to 2:30 p.m.
2nd/4th Tuesdays: 10:00 a.m. to 7:00 p.m.
2nd/4th Saturdays: 9:00 a.m. to 2:00 p.m.
Again, if you have any questions or concerns regarding anything in this guideline or anything else that comes up during your participation with Hope Station, please do not hesitate to contact our office at 503-339-7710 or information.hopestation@gmail.com . Thank you for your participation in Hope Station. We look forward to working with you! Hope Station Community Services, Inc.